What's more classic than spaghetti and meatballs? It's traditional across almost any dinner table no matter your background or food preferences. It's one of those dishes that is well known throughout the world. In honor of a classic dish we're serving ciliegine mozzarella stuffed meatballs over whole wheat capellini pasta with a housemade heirloom tomato marinara. Now you may be asking, what's so special about spaghetti and meatballs? First off, this isn't your typical dish that comes out of a jar. All ingredients are made fresh, in house. 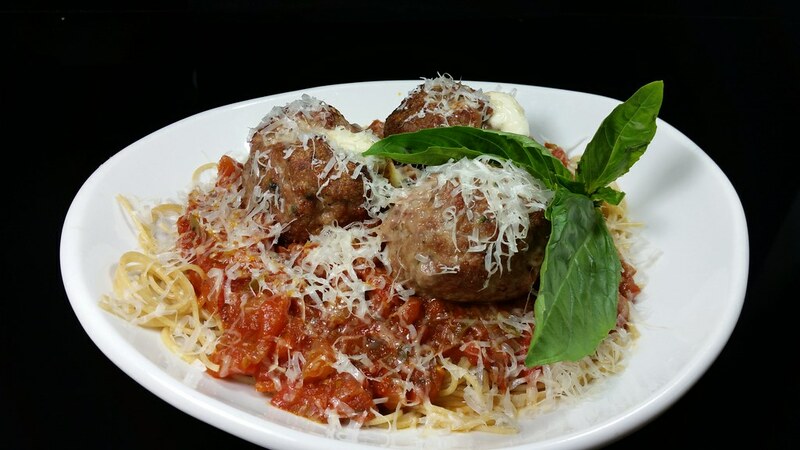 Our meatballs are hand-rolled around ciliegine mozzarella, which is Italian for "cherry size" mozzarella. The creamy and moist cheese is perfect to wrap the meatballs around in order to keep them from drying out, plus it also adds a new twist to this classic dish. Also, we are not using some generic, out of the jar marinara. Our marinara is made in house using only the freshest and locally grown heirloom tomatoes. Heirlooms are prized during this time of year and can be found in a few of our other featured dishes that are available on the menu. These tomatoes are known to not have as long of a shelf life as a normal garden tomato, so we can guarantee that this dish is only going to be around for a VERY short period of time.